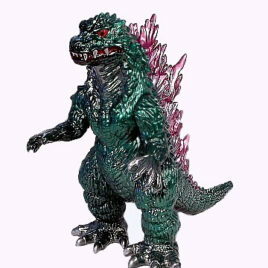 This is the Limited Super Crystal Godzilla 2000. This striking figure was limited to only 2000 figures made. The figure did not come with a tag. 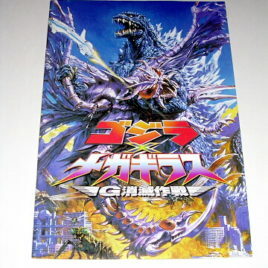 It was a "Contest Prize" from Toho Co. of Japan. 2,000 people were selected in a drawing in Japan to attend the premiere of the Toho Movie "Godzilla 2000". 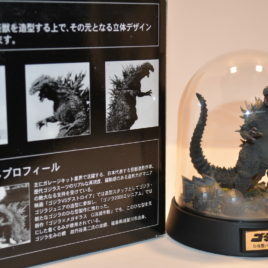 Each contest winner was presented with one of these Limited Super Crystal Godzilla 2000 figures. The figure stands approx. 6 inches tall. VERY HARD TO FIND EVEN IN JAPAN! 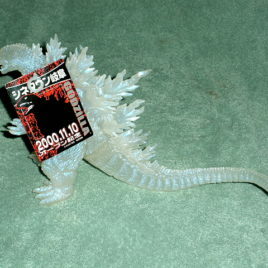 THIS IS THE AWESOME "PEARL" SPECIAL LIMITED GODZILLA 2000. Only 700 of these figures were ever produced! Available at the grand opening of a Theater in Gifu, Japan in 2000, this is a very, VERY difficult figure to find EVEN IN TOKYO! 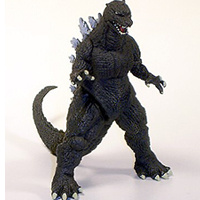 Made by BANDAI Co. of Japan, this highly detailed Godzilla 2000 figure is articulated at the arms, and legs. WE LIVE IN JAPAN AND HAVE ONLY SEEN THREE OF THESE FOR SALE. The vinyl for this figure is not CRYSTAL, it is PEARL! The Pearl effect of the vinyl is hard to catch of film, but it looks like a PEARL! The back of the tag for this special figures is blank except for some black markings. The figure comes MINT WITH MINT TAG! CLAWMARK TOYS WARNING: COLLECTING VINYL KAIJU FIGURES CAN BE HABIT FORMING! Scroll down to view more photos. 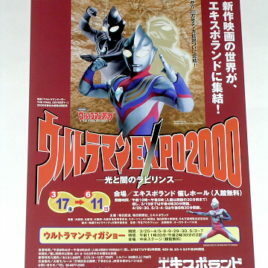 This is the Ultraman EXPO 2000 Special Limited Mini Poster. This colorful mini poster was released in 2000 to celebrate the opening of the Ultraman EXPO in conjunction with the opening of the movie "Final Odyssey" in Japan. Measures approx. 12 by 8 inches on light paper stock. GODZILLA 2000!! Get this ORIGINAL Japanese Theatrical Poster which we purchased during our 6 years of living in Japan. This PHOTO STYLE ONE SHEET is Approx. 20 1/2 by 28 1/2 inches. ALL of Clawmark Toys posters are ORIGINAL Theater Posters we picked up at the Japanese Theaters.. no REPRODUCTIONS.!! M1 also known as M Ichigo produces some of the finest collector vinyls available in Japan. Their paint jobs are amazingly beautiful! The vinyl they use is top quality and thick. 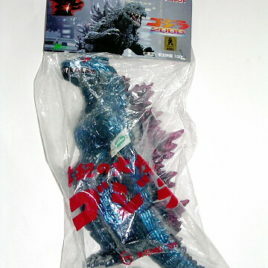 This is the Godzilla 1999-2000 hard vinyl figure produced in 2000 by M1 of Japan. 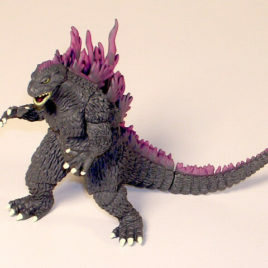 This figure represents Godzilla from the movie "Godzilla Millennium 2000. The figure stands approx. 9 inches tall. This figure comes mint in bag with colorful header card. Articulated at the arms and legs, this is an outstanding and hard to find M1 figure with an amazing paint job! 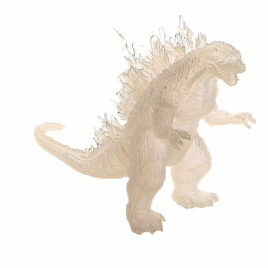 This impressive GODZILLA 2000 vinyl figure stands approx. 6 inches tall, is approx. 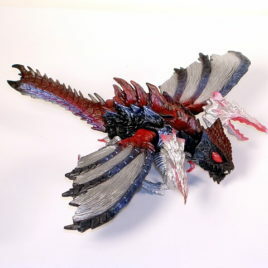 12 inches long and is fully articulated at the arms and legs. This represents Godzilla with the largest fins of all! A very colorful and very hard to find figure. Comes in MINT Condition with Attached tag. Scroll down to see additional photos. M1 aka M Ichigo makes some of the most highly regarded Japanese Collectible Vinyls. The company owned by Yuji Nishimura makes figures of premium quality vinyl and then hand paints each figure. 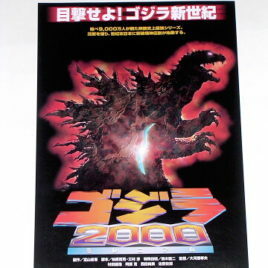 Here is Godzilla 2000 Millenium. This is the Blue Version which stands approximately 9 inches. This figure has an awesome paint job. It comes mint in bag. 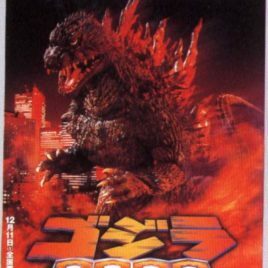 GODZILLA 2000! M1 aka M Ichigo makes some of the most highly regarded Japanese Collectible Vinyls. The company is owned by Yuji Nishimura who makes figures of premium quality vinyl and then hand paints each figure. 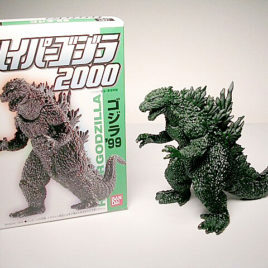 Here is Godzilla 2000 Millennium GREEN Version. This beautiful figure stands approximately 9 inches tall and is articulated at the arms and legs. This figure has an AWESOME paint job. IT COMES MINT IN BAG WITH COLORFUL HEADER. Scroll down for additional photos. From Bandai 2000 and now out of production is this soft vinyl Gomes aka Gomess. Gomess is another Godzilla in disguise. 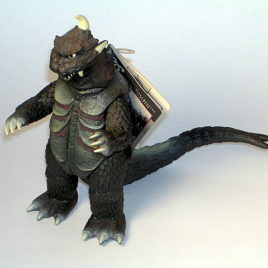 Tusburaya productions used a Godzilla suit and redesigned it to make Gomes for the Ultraman Q series. He is articulated at the arms, legs, neck and tail and stands approximately 7 1/2 inches tall from tip of horn to feet. This figure is in MINT Condition with a MINT Tag. Please Scroll down to see additional photos. This is a VERY HARD FIGURE TO FIND!! 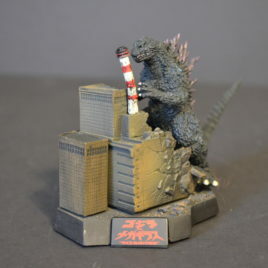 This is one of the MOST AWESOME Godzilla Figures WE have EVER SEEN. 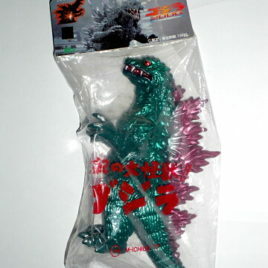 Produced by THE BANPRESTO Company in 2000 We call this the GODZILLA 2000 MEAN GREEN FIGURE!!! Sculpted by the LEGENDARY YUJI SAKAI, this figure looks so real, Diane and I keep waiting for him to ROARRRR!! The parts must be snapped together, using a hair dryer to heat up the parts to make them snap together easily. Standing approx. 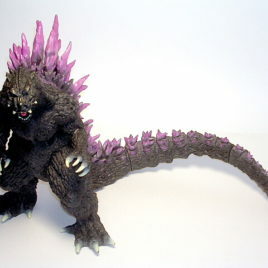 12 inches tall and over 16 inches long, this is one of the MOST IMPRESSIVE GODZILLA 2000 FIGURES EVER MADE!! This figure is already together and only needs his tail "snapped" on. He is in MINT to Near Mint Condition just a little paint rub on some of his foot claws. Does not include bag or header. CLAWMARK TOYS WARNING; NOT FOR VERY YOUNG CHILDREN DUE TO SHARP POINTS ON FINS AND HARD VINYL. The G2000 Theater Exclusive vinyl figure represents Godzilla 2000 glowing intensely as he readies for the final showdown with the vicious Alien Monster Orga!! These Theater Exclusive figures were ONLY available for sale at certain Movie Theaters in JAPAN. The figure stands approximately 6 inches tall. Made of Translucent light orange vinyl impregnated with Glitter! It comes with tag complete with Theater exclusive sticker. 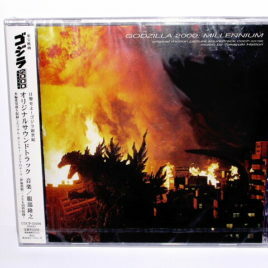 This is the Godzilla 2000 movie sound track. Everybody lets do the Orga Stomp!! From 1999 COCP-50196. Godzilla 2000 looks really mean!! Blazing colors on a 8 by 10 inch mini poster. 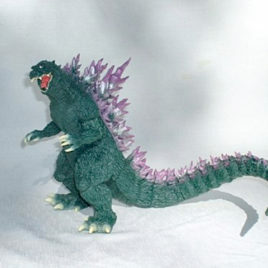 This magnificent small version of the Millennium GODZILLA showcases his lethal fins. 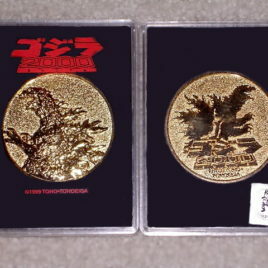 It makes a wonderful stocking stuffer for Godzilla Fans. 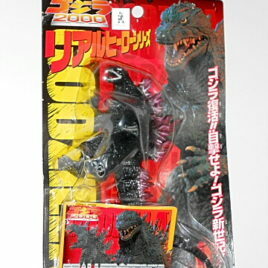 This is the Hyper Godzilla 2000 from the Godzilla 2000 Hyper set of 7 figures. Bandai produced these in 1999 and they are out of production. This highly detailed solid vinyl Hyper figure stands approx. 4 1/2 inches tall. Requires vinyl parts be "Snapped" together. CLAWMARK TOYS WARNING: Small parts not suitable for very young fans! 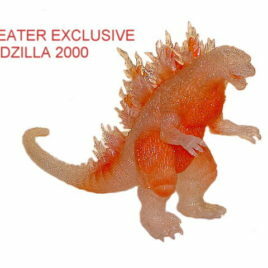 Godzilla 2000 from the Godzilla Chronicles # 1 High Grade set. This series of figures has been out of production for 10 YEARS. Each highly detailed vinyl mini figure stands approx. 2 inches tall. CLAWMARK TOYS WARNING!! Small parts might be hazardous for very young fans. This is the Special Limited Edition "Chase" Figure from the Yuji Sakai Diorama Series #2. It is out of production and hard to find. The coloration is black, white and gray. The diorama requires snapping together. It stands about 3 1/2 inches high. Not suitable for children under 5 years due to small parts. 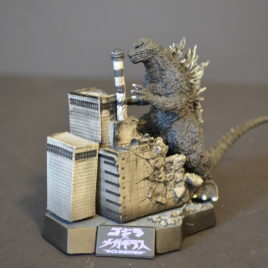 From Yuji Sakai Diorama set # 2 Godzilla 2000 (Godzilla vs. Megagurius) This shows Godzilla onshore by a factory. The diorama is made of vinyl and stands approximately 3 1/2 inches tall. It comes with a stand and must be snapped together.